Akebono Develops World's First "Electric Parking Brake for Small-to-Mid Sized Trucks" ｜News｜Akebono Brake Industry Co., Ltd.
Akebono Develops World's First "Electric Parking Brake for Small-to-Mid Sized Trucks"
Tokyo, Japan - (June 14, 2018) - Akebono Brake Industry Co., Ltd. announced today the development of the world's first "Electric Parking Brake for Small-to-Mid Sized Trucks." This brake system was developed from the technology accumulated through the years of researching electric parking brakes. Compared to existing volume-produced products from other manufacturers, this new electric parking brake generates more powerful clamping force. 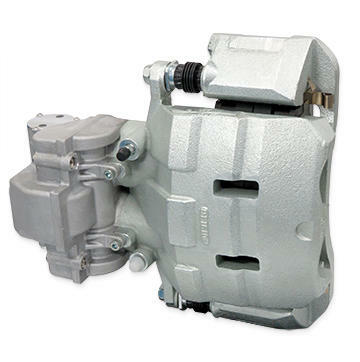 Akebono's electric parking brake is based on 2-piston brake systems, which are widely used on small-to-mid sized trucks. Designed to be adapted to such systems, our brakes have a unique construction where one motor's output can be transmitted to two pistons via two spindle mechanisms. As a result, power output is 200% of existing volume-production components offered by other manufacturers. Most of these existing products transmit the single motor's output to only one piston via one spindle mechanism. The required electric current value is 14 Amperes, which is equivalent to that of existing products for passenger cars. Weight can be reduced by 3 kg per vehicle. As the electrification of automobiles gains momentum and more onboard systems become controlled by electronics, the requirements for brake systems are shifting towards further reduction of power consumption, vehicle weight reduction and enhanced safety. As for availability, the manufacturing system will be completed in 2019 to realize volume production of the new electric parking brake. In the future, Akebono expects to further expand its business with this electric parking brake at the core. In the field of research and development, Akebono is committed to developing various electric brake calipers by integrating the technologies accumulated over the years, and the technologies that has been newly realized to promote differentiation. Akebono will accelerate the research and development of unique technologies to continue the challenge to lead the world in the area of the company's core competencies, "friction and vibration, their control and analysis."